I’ve always encountered Saeco in connection with big, powerful, high end machines, so I was curious how they’d adapt to the more modest demands of the home market. My old hot plated carafe got broken in a recent move so when I saw a Saeco TDCM-GL Renaissance 10-Cup Digital coffee maker on sale in my local hardware shop I liked the price enough to give it a try. You’d think that one carafe machine was very much like another but there are some nice little features to the Saeco TDCM-GL Renaissance that make life a little easier. One immediate feature that I like is that you don’t have to wait for the whole pot to fill. The coffee maker allows you to pause the brewing process so that you can grab a cup while it’s still dispensing that lovely black gold – great on a cold morning or if you’re in a rush to get out the door. Another benefit is that the Saeco TDCM-GL isn’t a huge beast of a machine. It’s about the right size to push next to your microwave under the cupboards. I’ve not had any problems with excess steam so I leave it quite content in there with enough slack in the cord to pull it forward when I need to fill the water tank. The coffee maker is light enough that you can fill it from the tap, but to be honest I just usually fill the carafe itself and pour it in, if only for that reassurance I’m not pouring in more water than will fill the jug (There’s a smaller version of this coffee maker. The Saeco TDCM-CC Renaissance 8-Cup Digital Drip Coffee Maker with a thermal insulated stainless steel and ceramic carafe). If you’re looking for a coffee maker that will make coffee strong enough to knock your socks off, then this probably isn’t the one for you – I like mine smoother so it’s actually a draw for me that I can whack the strength up and have something flavorsome rather than challenging. The Saeco TDCM-GL is also not something that’s suited to sitting for hours on end in an office if you’re not frequent users. There’s a cut-off in the machine that will switch it off after a couple of hours – which is great for after supper, if you’ve put it on when you’ve got guests round – or if you’re working in a team that’s constantly in and out as you’ll save on the electric bill if you forget to switch it off yourself. The coffee maker is not so great if you put it on just before you head out for a couple of hours and get caught in traffic or ambushed into a meeting – there is at least a pretty reliable timer so you can leave it to start brewing up just before you get back though. All in all then, it’s a nice simple little machine – it doesn’t have all the whistles and bells of a big exciting all-in-one brewer, but it just plain works and sometimes that’s all you need. 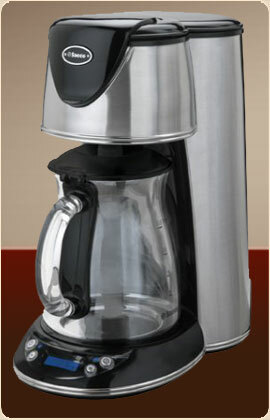 How do I obtain a replacement urn for the TDCM-GL model coffee maker I am very upset that mine cracked and no one has a replacement pot.